Nestled in a valley surrounded by chalk hills nearly mountain-like in steepness, the tiny hamlet of Maimbray is a humble looking village, forming right angles with neighboring Chavignol and Verdigny. Here Pascal and Nicolas Reverdy bootstrapped their operation from the ground up, year by year, having begun with almost no capital. When I met them in 1995, the brothers were already regarded in France as one of the finest producers of Sancerre Rouge. 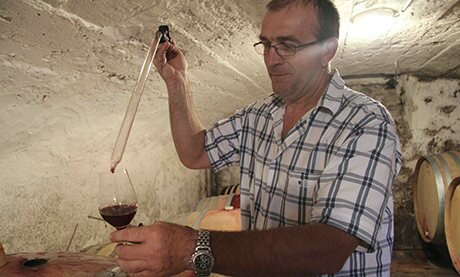 Tragically, Nicolas was killed in an accident in the vineyards in late November 2007, but his wife Sophie has joined Pascal and his wife, Nathalie, in the enterprise and works full-time in the vines with Pascal. The soil here is almost pure Terres Blanches - fossilized Marne/Kimmeridigian limestone and clay. The yields are low, about 50 Hl/Ha, with excellent natural ripeness and concentration of Sauvignon/mineral character. The cuvee Angelots is from “Les Lots”, a single lieu-dit just south and west of Maimbray in the direction of Chavignol. The vines are about 75 years old, on fossilized Kimmeridgian limestone. Vinification and aging are done in a large oak “cuve tronconique”. The rouge, “a Nicolas”, is a small selection of the best Pinot Noir vines, aged in demi-muids. The Reverdys harvest exclusively by hand, and do not filter any of their wines - white or red. Traditional vinification with low temperature fermentation & maturation on fine lees in tank. Pale color, dry, but fruity with aromas of white currant, apricot & peach. Bottled unfiltered. A single hillside plot of 55 year old vines on chalky Kimmeridgian Marne (aka Terre Blanche), hand-harvested at 45 hl/ha. Fermented and aged in stainless steel tanks. Bottled unfiltered. 70+ year old vines, mostly from a single plot, hand-harvested at less than 40 hl/ha and fermented and aged on the lees in large oak tronconique. Bottled unfiltered. 30+ year old vines. Hand-harvested, indigenous yeasts only used. Aged in foudre. Bottled unfiltered.